The Detect Fall Negative block determines if the input is less than zero, and its previous value is greater than or equal to zero. Output signal, true (equal to 1) when the input signal is less than zero, and its previous value was greater than or equal to zero; false (equal to 0) when the input signal is greater than or equal to zero, or if the input signal is negative, its previous value was also negative. Set the initial condition of the Boolean expression U/z < 0. 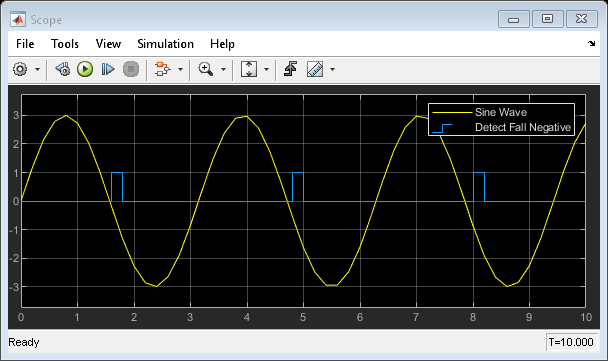 Detect when a signal value decreases to a strictly negative value from a value that was greater than or equal to zero.